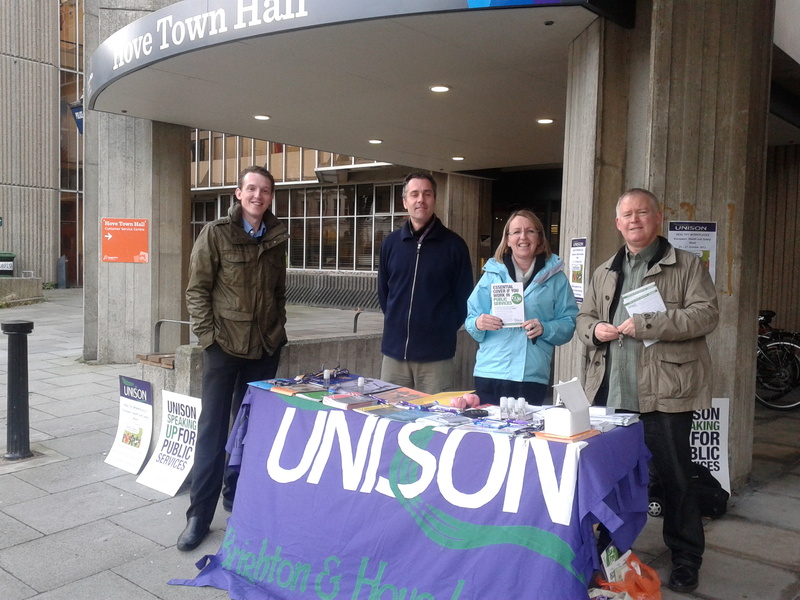 Unison branch members and regional staff were outside Hove Town Hall on Monday (14th Oct) encouraging council staff to join the union. With a high proportion of the eligible workforce already in Unison the branch is in a strong position to encourage staff not already signed up to join. With European Workplace Health & Safety Week coming up the message to staff was “Take your break!” They were offered Time Out chocolate bars or other – healthier – Unison alternatives such as pens, lanyards and squeezy stress busters. Look out for the recruitment stall again at Kings House on Friday (18th Oct) and Bartholomew House on Tuesday (22nd Oct). You can also download an application form to join Unison on this site.